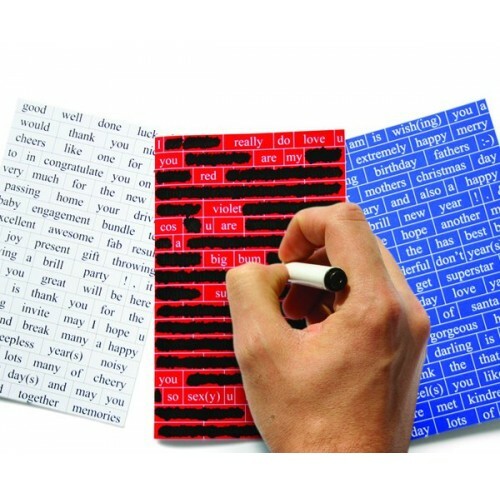 Say It With Words is a pack of 3 themed do it yourself greetings card - plus a special marker pen! Say It With Words are designed in the style of 'fridge poetry', the idea being that you use the pen to blank out the words you don't want to make your own personalised message. The pack of DIY Greeting Cards contains 1 x romance/love themed card, 1 x thank you/congrats themed card, 1 x celebration themed card. For everything from Mother's Day and Father's Day to a new baby or saying sorry, these Say It With Words - DIY Greeting Cards are a totally unique way to get your message across and the perfect gift to give anyone who is a bit bad at making an effort at those special times.